ZAMBOANGA CITY, Philippines (Mindanao Examiner / Mar. 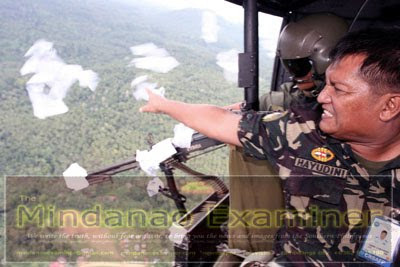 10, 2011) – Military helicopters fired rockets on Thursday on suspected hideouts of Abu Sayyaf militants with links to al-Qaeda terror network at an island off Zamboanga City in the southern Philippines, officials told the Mindanao Examiner. Officials said Special Forces soldiers also parachuted on Sacol Island after the raid to hunt down Khair Mundos, who is a key leader and financier of the Abu Sayyaf group. “There is an ongoing operation in the area and two military MG-529 choppers fired at least seven rockets on suspected Abu Sayyaf hideout on the island. We still don’t know if there were casualties in the raid, but the operations began at around 5:20 in the morning,” said Army Lieutenant Colonel Randolph Cabangbang, a regional military spokesman. He said the target of the operation was several nautical miles off Zamboanga City. “No community was near the objective and no civilians were hurt in the operations,” he said. He said Mundos was with a ruthless commander Puruji Indama, whose group was behind the beheadings of soldiers and civilians in the nearby province of Basilan in recent years. Indama has been linked in the past to Malaysian bomber Zulkifli bin Hir, alias Marwan, a member of the Indonesian terror group called Jemaah Islamiya. Mundos was first arrested by Filipino authorities in 2004 arrest on the first-ever money laundering charges against terrorists initiated by the U.S. in coordination with Philippine officials. The State Department said while in police custody, Mundos confessed to having arranged the transfer of funds from al-Qaeda to Abu Sayyaf group leader Khadaffy Janjalani to be used in bombings and other criminal acts throughout Mindanao.